After taking two podiums at Imola, the Aruba.it Racing - Ducati team is ready to resume action and take up the challenge at Donington (United Kingdom), home of the sixth round of the 2018 WorldSBK Championship. On the historic Leicestershire track, that hosted the first ever WorldSBK race back in 1988, Chaz Davies is keen to collect his first ever success in the top class, while Marco Melandri has two wins to his tally but the last one dates back to 2012. For both, as the half-way point of the season approaches, the goal is to beat their closest rivals in the championship and narrow the gap in the rankings. Michael Ruben Rinaldi, twice seventh at Imola and progressively adapting to the WorldSBK class, will once again join the action with the Aruba.it Racing - Junior Team. 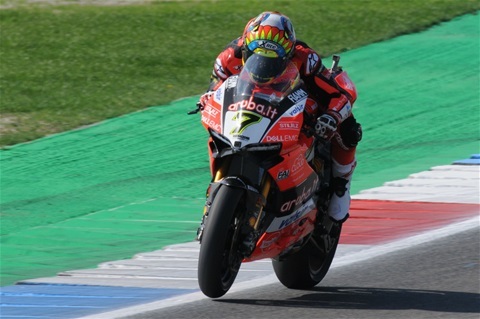 After five rounds, Davies (162 points) and Melandri (131 points) are respectively second and fourth in the championship, while Rinaldi is twelfth. The Aruba.it Racing - Ducati team and the Aruba.it Racing - Junior Team will resume action Friday, May 25th, at 09:45 local time (CET -1) for the first free-practice session. "Donington is a track I really enjoy and, being from the U.K., the atmosphere there is awesome and the home crowd support is always great. My first time out there was back in 1999 and I had some great results with two-strokes, but not yet with Superbike unfortunately. But, we've made improvements every year and it seems that we have been getting closer to our main rivals around there, so the goal is to find the next step and hopefully we'll have some results to cap off the weekend nicely." "I really love Donington as a track and I had some great races there in the past. It wasn't the case last year, but we had just entered a difficult stretch back then while now we know much better our strong suits and where we need to improve. It looks like the weather will be nice, which is a good starting point, and our package is getting dialed in better and better, even though our rivals seem to have further improved. The Mugello test yielded some important confirmations, so I can't wait to ride again."